This show was struggling with its production schedule just like I was struggling to finish this series of posts. This episode takes us on a tour through Pure Illusions we already were familiar with as Papika and Yayaka race to rescue Cocona from her mother’s dark side (Darth Mimi from here on). The artstyle kept on changing throughout the episode, and not like the fascinating spectacles we witness when an episode allows individual key animators to show off their personal approaches to animation; this was a messier endeavor, not an intentional decision. The cause should be obvious when you look at the credits – look at the ridiculous number of animation directors supervising the drawings! Nobody has a clear answer as to exactly what went wrong, but the production schedule collapsed and the staff had to race against the clock to finish the last two episodes in time for the broadcast. It’s possible 3hz simply wasn’t ready to produce the series without fully outsourcing a single episode to a subcontractor, and the schedule was gradually falling behind as the series progressed. Perhaps it had more fundamental issues during preproduction that we still don’t know about. 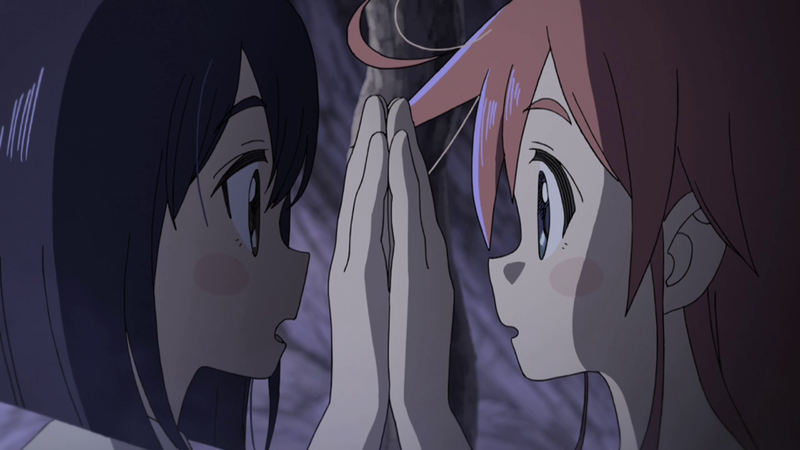 Whatever the cause, I already skipped the coverage of episode 11 because I didn’t have much to write about its craft in general – it was the point where Flip Flappers‘ general quality took the nosedive. And while the final two episodes were clearly even more rushed, the allocation of staff was much stronger so we still got strong work worth looking at. First of all, Mob Psycho 100 star Yoshimichi Kameda arrived to help his friend Oshiyama, going as far as giving episode direction a try for the first time, albeit just for one segment of it. I assume he also did animation direction for the latter part of the episode – mainly the fight in episode 8’s Pure Illusion – and key animation for the final scene. Many people (myself included, to be honest) expected this episode to have much more of Kameda’s flavor, especially after his spectacular showcase last season. However, lack of time is often an animator’s biggest foe. Fan favourite Hironori Tanaka also contributed to the animation direction, but his work is frankly indistinguishable; by the end of this series we’ve seen outstanding animators like him and Ryu Nakayama doing supervision work with none of the flair you would usually expect from them. Finishing the series in time was the goal at this point, so there weren’t many opportunities for flourish. Hakuyu Go, whom I covered in my My Hero Academia write-up, returned to the show to animate what was possibly the most exciting piece of animation in the episode. Mob Psycho‘s Yuki Igarashi animated the MUSCLE transformation of Bu-chan. Only a show as unique as Flip Flappers would allocate a scene during its climax to a ridiculous Popeye gag. In the final episode, Papika and Cocona reunite to fight the evil Darth Mimi. As you can see, the credits are a lot less packed than the previous episodes. No, the schedule wasn’t friendlier – in fact it was as tight as Nyunyu’s unnecessary revealing outfit. The main reason for it is without a doubt the series director Kiyotaka Oshiyama. I’ve already dedicated a post to his talent, but he went above and beyond for this episode. He drew around 250 cuts of rough key animation in just a single week. For the record, your average 20 minutes long TV anime episode has around 300 cuts. I suppose this episode had a bit more, but that doesn’t change the fact that Oshiyama drew roughs for the vast majority of the episode. It was revealed at a talk event with industry giants such as Mitsuo Iso (who was personally very displeased with Flip Flappers, but enough of a legend that we refer to our animation awards as The Isos), Osamu Kobayashi, Masaaki Yuasa and Takashi Mukouda. The reason why Oshiyama did such a massive amount of work is simple: with only around two weeks to finish the episode, hiring key animators – including artists who would be be completely new to the series – and then having to correct their work would be more time consuming. He said: “If I do it alone, it’ll be faster“. He’s been praised for his exceptional drawing speed in the past, and now we know that was no exaggeration. What a guy! Takashi Kojima then shared on twitter that he worked on the final episode for a mere 10 days! Even though he was busy with corrections and there was almost no time left, he wanted to do key animation for the final scene. I think the result was fairly satisfying. Katsuhiko Kitada and Yoshimichi Kameda continued to work on the finale after episode 12. Fun fact: Oshiyama, Kojima, Kitada and Kameda had desks next to each other. You could say they were the big four of the final episodes. I don’t know who animated the first action scene of the episode, but its a well crafted scene elevated by exciting camera work. Keiichiro Watanabe, who was absent since episode 8, returned to animate this exhausting action scene, where our main duo avoids Darth Mimi’s vicious attacks. I think the timing of movement and overall style is very reminiscent of his work on the first episode. Hakuyu Go presumably animated Darth Mimi wrecking our main duo. As you could probably tell, I wasn’t a fan of the last quarter of the show, and thus I avoided talking about the plot all that much. Tight foreshadowing doesn’t always translate into a very satisfying experience, so I’ll always prefer the fun I had early on. And while relatively disappointed, I’ll remember the show fondly because of Oshiyama’s extraordinary visual sense and inventiveness. Even as the project struggled at the end the production values remained above the average when it comes to TV anime, so it wasn’t a complete disaster. Oshiyama is also a storyteller with great future, and while I can’t say that anything in Flip Flappers topped his work on Space Dandy #18, I’m eagerly awaiting his next work – with none other than Masaaki Yuasa! Iso flat out said this project wasn’t the kind of thing that allows Oshiyama’s talent to shine (with Oshiyama right in front of him, which makes it a bit awkward even if he said it because he really appreciates him). Though of course he has a genuine trauma over his baby Dennou Coil’s commercial failure, so all his rants against producers, the moe menace and modern anime are to some degree him lashing out. Being a genius doesn’t make him automatically right about everything. agreed; being a genius doesnt make him right about everything. I attributed part of his saltiness to his feelings about the current state of the anime industry (not completely unwarranted) after looking into the whole dennou coil drama and the conflicts he had with takeshi honda during the project. Just wondering about Iso’s comments kVin, do you actually know Japanese or are you just going by hearsay? You should doubt my knowledge of any and all languages, not just Japanese. Takeshi Honda reportedly left Dennou Coil’s production early on because he couldn’t handle working under Iso’s obsessive eye for perfection. Honda was the character designer and thus Chief AD and animation director of the OP/ED and first episodes… but he vanished entirely after that, lending credence to those rumors. Ever since then they didn’t work together again (it even became a running joke, ‘now we won’t have Iso back in Eva because Honda is in it!’) so people eventually assumed it was all true. No official confirmation will ever happen but… yeah it seems like something along those lines happened. Welp, now I’m really excited to see what Oshiyama does next. Especially if that Yuasa collaboration thing holds true. Full access to these events is impossible but we might be able to help you out here, with this one in particular too.